PART 1 GENERAL ISSUES The Advanced Networks and Services Underpinning Modern, Large-Scale Science: DOE's Esnet, W. E. Johnston. Netsolve: Grid Enabling Scientific Computing Environments, K. Seymour, A. Yarkhan, S. Agrawal, and J. Dongarra. Operations Research Methods for Resource Management and Scheduling in a Computational Grid: A Survey, A. Attanasio, G. Ghiani, L. Grandinetti, E. Guerriero and F. Guerriero. Peer-to-Peer Protocols and Grid Services for Resource Discovery on Grids, D. Talia and P. Trunfio. Data Placement in Widely Distributed Environments, T. Kosar, S.-C. Son, G. Kola and M. Livny. The Grid Relational Catalog Project, G. Aloisio, M. Cafaro, S. Fiore and M. Mirto. PART 2 PERFORMANCE The "MIND" Scalable PIM Architecture, T. Sterling and M. Brodowicz. SLA-aware Job Migration in Grid Environments, F. Heine, M. Hovestadt, O. Kao and A. Keller Micro-grids - the exploitation of massive on-chip concurrency, C. R. Jesshope Autonomous Performance and Risk Management in Large Distributed Systems and Grids, M. Brittan and J. Kowalik Optimization Techniques for Skeletons on Grids, M. Aldinucci, M. Danelutto, J. Duennweber and S. Gorlatch Towards a Middleware Framework for Dynamically Reconfigurable Scientific Computing, K. El Maghraoui, T. Desell, B. K. Szymanski, J. D. Teresco, and C. A. Varela. PART 3 APPLICATIONS Messaging in Web Service Grid with Applications to Geographical Information Systems, G. Fox, S. Pallickara, G. Aydin and M. Pierce NewsGrid, S. Geisler, G. R. Joubert UNICORE – From Project Results to Production Grids, A. Streit, D. Erwin, Th. Lippert, D. Mallmann, R. Menday, M. Rambadt, M. Riedel, M. Romberg, B. Schuller and Ph. Wieder Developing Innovative Technologies for the Grid, J.-P. Prost, L. Berman, R. Chang, M. Devarakonda, M. Haynos, W.-S. Li, Y. Li, I. Narang, J. Unger and D. Verma Tools for Efficient Subsetting and Pipelined Processing of Large Scale, Distributed Biomedical Image Data, M. Ribeiro, T. Kurc,Tony Pan, K. Huang, U. Catalyurek, X. Zhang, S. Langella, S. Hastings, S. Oster, R. Ferreira and J. Saltz. The book deals with the most recent technology of distributed computing. As Internet continues to grow and provide practical connectivity between users of computers it has become possible to consider use of computing resources which are far apart and connected by Wide Area Networks. Instead of using only local computing power it has become practical to access computing resources widely distributed. In some cases between different countries in other cases between different continents. This idea of using computer power is similar to the well known electric power utility technology. Hence the name of this distributed computing technology is the Grid Computing. 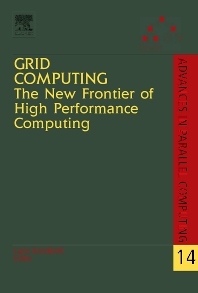 Initially grid computing was used by technologically advanced scientific users. They used grid computing to experiment with large scale problems which required high performance computing facilities and collaborative work. In the next stage of development the grid computing technology has become effective and economically attractive for large and medium size commercial companies. It is expected that eventually the grid computing style of providing computing power will become universal reaching every user in industry and business. Researchers, (post-) graduate students and professionals in Computer Science and Grid Computing.